Composed by Alain Boublil and Claude-Michel Schonberg. Easy Piano Vocal Selections. Broadway. Songbook. With vocal melody, piano accompaniment, lyrics, chord names, introductory text and color photos. 80 pages. Published by Hal Leonard (HL.365280). February 25, 2012 Bring This Book Home! 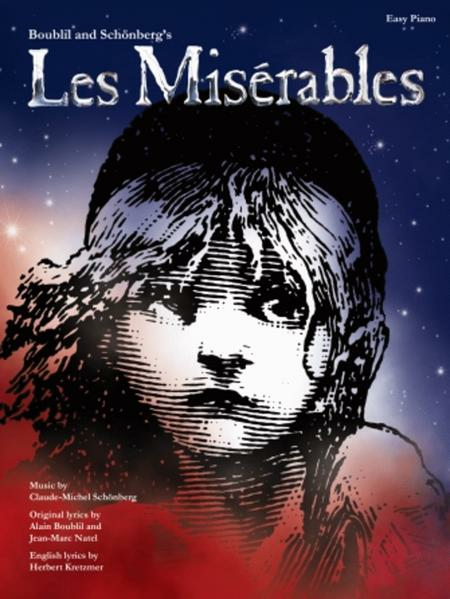 Excellent arrangement of many of the songs from Les Miserables. Enjoy playing over and over again. Bring it home! 21 of 49 people found this review helpful. This music booklet was exactly what was ordered - in excellent condition and on time. 29 of 62 people found this review helpful. Miserables. I have been playing piano for a little over five years, and I found these pieces at the right difficulty. 34 of 68 people found this review helpful. choice of songs and great for Les Mis fans but it's limited and you could easily learn the whole book. Often the backing of the actual songs and main themes aren't shown in this piano part, but an okay replacement/interpretation with different left hand. Nice explanation of the musical at the front, overall a good buy. Brilliant for young pianists or for sightreading, could be adapted for more advanced players as chords are shown. 40 of 86 people found this review helpful. August 27, 2008 Love it! This book is perfect for my level. I can play the songs easily and they are beautifully written. Obviously they aren't the full score, but the music is just lovely anyway. I particularly like "Bring Him Home". 32 of 65 people found this review helpful.